Last week I came home to find an A4 sized envelope waiting for me. 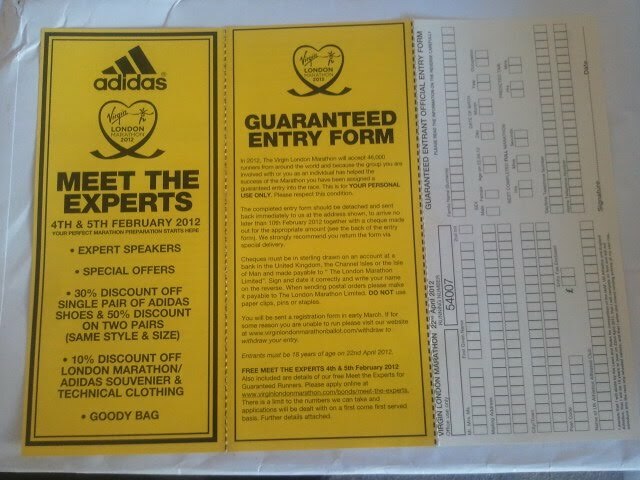 When I opened it up I was very excited to find my London Marathon guaranteed entry form inside! As I got my place through a charity I’m not yet actually registered with the marathon itself so I had to fill in the entry form and send it back within 7 days to make sure that my place is confirmed. So this morning I went off to the Post Office with my completed form in hand and sent it off via Recorded Delivery. As a charity runner I’ve got what’s known as a Golden Bond place for the marathon. As a Golden Bond runner I am also given free entry to one of the ‘Meet the Experts’ days in February. This sounds like it’s going to be a really interesting and informative day with speakers such as David Bedford who is the Race Director and Liz Yelling who is the Commonwealth Games bronze medalist. There’s also an opportunity to get discounts on running shoes and kit – I’m always keen to add to my collection! 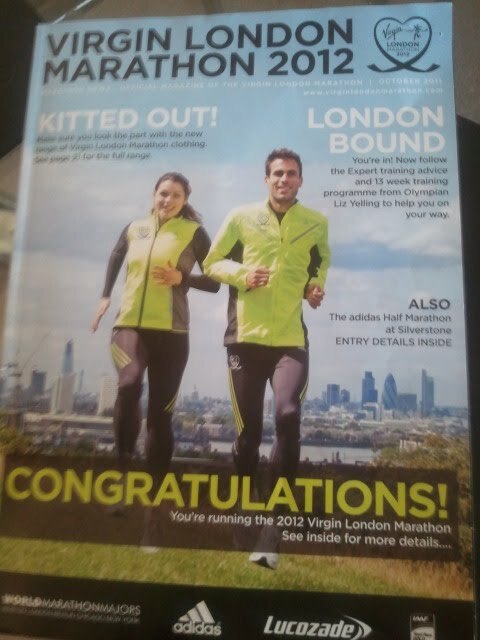 Also within the pack was a Virgin London Marathon magazine which is packed with information for me to read through in the next few months. ** check back here in a few weeks once my training plan has started properly and I’m out running in the freezing cold to see whether I’m still quite as excited! Now i'm officially jealous I can remember the GSR stuff arriving and how it felt, I will be training in the cold as well down here.